Confocal microscopy is an imaging technique that provides higher resolution micrographs than that of traditional optical microscopy. Confocal microscopes attain this higher resolution from an image sensor behind a pinhole. By eliminating out of focus light, and by scanning the specimen back and forth under the microscope, a very high resolution image may be produced. This technique has applications ranging from life sciences to semiconductor work. For this year’s Hackaday Prize, [andreas.betz] is building a confocal microscope using little more than a Blu-ray drive read head. [andreas]’ build uses a standard Playstation 3 Blu-ray drive mechanism. The read head for this mechanism is well documented, but [andreas] still has to drive the laser and the voice coils for this machine to do anything. With the Blu-ray drive working, only the optics remained. Just this last week, [andreas] imaged the die of a transistor with a resolution of about 680nm. An inductor was also imaged, showing a track separation of about 10um. This is approaching the limits of optical microscopy, and the apparatus is simple enough for anyone to replicate. As a feat of technical ingenuity, this is a great project. It’s one of the best we’ve seen for the Citizen Science portion of the Hackaday Prize, and can’t wait to see what other images [andreas] can make with this machine. If we had a dime for every 555-based noisemaker circuit we see… But this one’s got a twist. [Tristan] does two things that elevate his sawtooth-wave noisemaker above the norm. First, he gets a clean sawtooth wave out of it so that it sounds about right. Then he manages to make it more or less playable. It’s a refined version of a classic hack. The first trick is a matter of putting a constant current supply upstream of the timing capacitor. 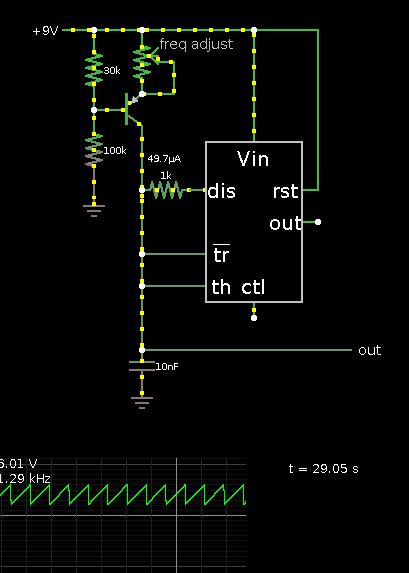 The usual 555-timer circuit just charges the capacitor up from the power rails through a resistor. This is fine if all you care about is timing. But because the current is proportional to the constantly dropping voltage difference, the voltage on the capacitor is an exponential function over time. We’ve always wanted to implement LED-to-LDR control while writing the Logic Noise series, but never found a reliable way to make it work. It’s cool to see [Tristan]’s efforts. Maybe we’ll pull a 555 out of the junk box in his honor. 3D printing seems like it takes forever when you’re waiting for a part to come out. But if you’re like us, the real time spent in making something new is in modelling and refining the piece. There are tons of CAD programs out there, and finding one that meets your needs is part functionality and part personal preference. Reader [Leibowitz] pointed us to Solvespace, and it looks like it fills the gap between something like OpenSCAD and something more feature-full (and complicated) like FreeCAD. We’re wondering why we hadn’t heard of Solvespace before. It looks great. It has a lot of what we like about OpenSCAD — the ability to quickly and easily specify two 5 mm holes exactly 21 mm from each other, center-to-center and then change that distance easily. But it also has other features like constraint solvers for mechanisms and linkages. It looks like a great way to design your next Strandbeest. The tutorials seem like a good way to get started quickly. As we said above, choosing a 3D modeller is partly based on your requirements, but also partly on your feelings. If you’re feeling limited by OpenSCAD, there’s also ImplicitCAD. Or try out Autodesk’s free (but not open) Fusion 360. And now there’s Solvespace. It’s great to have options. Here’s a neat hack for making a magnetic charging mount for a cell phone. We know what you’re thinking, but this is definitely not a traditional contactless charging system. Those use magnets but in a different way. This hack involves putting a couple of magnets onto the case of the cell phone, and a couple more on a charging base. You then wire these magnets into the power inputs of the USB port, and a USB cable onto the base, so putting the phone on the base magnets completes the circuit. The magnets themselves become the charging contacts. It’s a neat idea, but makes us wonder what this will do to the compass sensor in your phone or your credit cards if they are nearby. With these caveats, it is a neat hack, and could be easily adapted. Want to make a vertical cell phone mount, or a way to attach (and charge) your cell phone to the fridge? This can be easily adapted for that. [Paweł Spychalski] wrote in to tell us about some experiments he’s been doing, using cheap 433 MHz HC-12 radio units as a telemetry radio for his quadcopter. In this blog post, he goes over the simple AT command set, and some of the limitations of the HC-12 part. Then he takes it out for a spin on his quadcopter, and finds out that his setup is good for 450 meters in an open field. Finally, he ties the radio into his quad’s telemetry system and tethers the other end to his cellphone through a Bluetooth unit for a sweet end-to-end system that only set him back around $20 and works as far out as 700 meters. The secrets to [Paweł]’s success seem to be some hand-made antennas and keeping the baud rate down to a reasonable 9600 baud. We wonder if there’s room (or reason?) for improvement using a directional antenna on the ground. What say you, Hackaday Antenna Jockeys? Also check out this very similar build where an ESP8266 replaces the Bluetooth module. And stashes it all inside a nice wooden box! Nice work all around. The idea of winding inductive guitar pickups by hand is almost unthinkable. It uses extremely thin wire and is a repetitive, laborious process that nevertheless requires a certain amount of precision. It’s a prime candidate for automation, and while [Davide Gironi] did exactly that, he wasn’t entirely satisfied with his earlier version. He now has a new CNC version that is more full-featured and uses an ATMega8 microcontroller. [Davide Gironi]’s previous version took care of winding and counting the number of turns, but it was still an assisted manual system that relied on a human operator. The new upgrade includes a number of features necessary to more fully automate the process, such as a wire tensioner, a wire guide and traverse mechanism (made from parts salvaged from a broken scanner), and an automatic stop for when the correct number of turns has been reached. All kinds of small but significant details are covered in the build, such as using plastic and felt for anything that handles the wire — the extremely fine wire is insulated with a very thin coating and care must be taken to not scratch it off. Also, there is the need to compute how far the traverse mechanism must move the wire guide in order to place the new wire next to the previously-laid turn (taking into account the winding speed, which may be changing), and doing this smoothly so that the system does not need to speed up and slow down for every layer of winding. This system is still programmed by hand using buttons and an LCD, but [Davide Gironi] says that the next version will use the UART in order to allow communication with (and configuration by) computer – opening the door to easy handling of multiple winding patterns. You can see video of the current version in action, below.